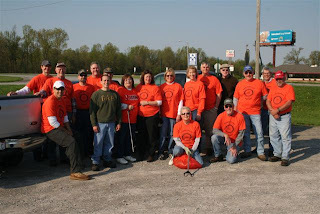 We had an awesome turnout for our Trash Pickup on April 12th. 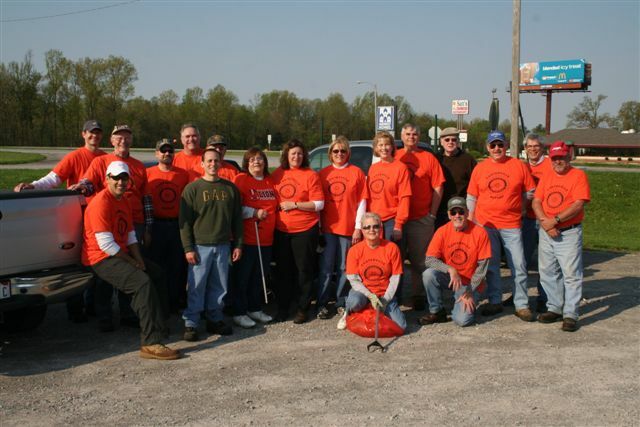 It was record attendance for the club in helping clean up our community. Thanks for everyone that came out! Carterville Rotary was busy in the month of September. First, we're excited to welcome two new members to the group: Bob Fuller and Jonathan Mitchell. 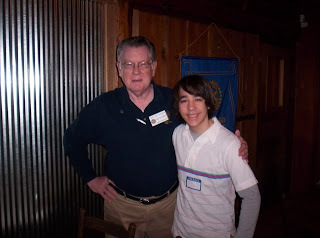 We're always pleased to accept new members to the Rotary family. We were also treated by a visit from the Illinois Baptist Disaster Team. They brought by their "Disaster Van" which was neat to see. Lastly, we were involved in the annual Carterville Free Fair parade. Many members came out to pass out balloons, suckers, and Rotary stickers to the Carterville public. The weather couldn't have been any more perfect. Carterville Rotary Club Shelter Box Arrives! It looks as if Carterville Rotary's Shelter Box has arrived to its destination in the Phillipines. Starting as the brainchild of one Rotarian with the support of his Rotary club in year 2000 – ShelterBox has grown to become the largest Rotary Club project in the 100 year history of the organization. Recognizing this worldwide support from the Rotary community, ShelterBox was designated as a Global Rotary Club Project in 2009. Logos with this designation will now appear on all ShelterBoxes, tents, blankets and ancillary materials. You can learn more about the ShelterBox project at their website here. 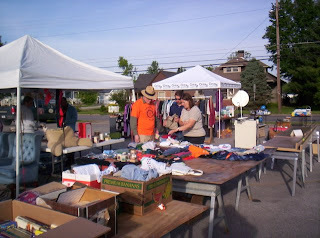 The Fund Raising Yard Sale we had for Baylen Earls raised an impressive $1116! Baylen will be traveling to Mexico to study abroad coming this August. Thanks to the efforts of the Carterville Rotary members and Woman's Life, Baylen will be able to enjoy this unique and exciting experience. Good Luck Baylen! 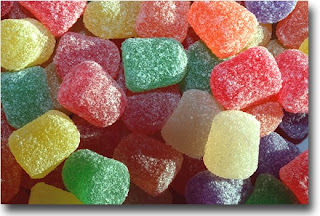 What is Gumdrop's NFP? We are a non-profit organization that provides a backpack with child-friendly foods to at-risk children for the weekends in southern Illinois. This program began January 2008 in the Carterville School System. The first drop provided backpack for 12 kids. By the end of the school year, we were delivering 64 backpacks. In January 2009, we were able to extend the backpack program to the Herrin School District. In both school systems, we are now feeding 200 backpacks a week to these at-risk children. As additional funding comes available, we will be expanding those backpack program to other school districts throughout southern Illinois. Behind the new bridal shop. Monetary donations - Payable to Gumdrop's NFP. Drop at point at 118 Elles Avenue, Carterville, Illinois, or give Ron or Amy a call, and we can come by and pick up the food. Ron Simpson - cell, 618-319-3829. Amy Simpson - cell, 618-319-3828, or at home, 618-985-4159. We had a special visitor last week at Carterville Rotary. 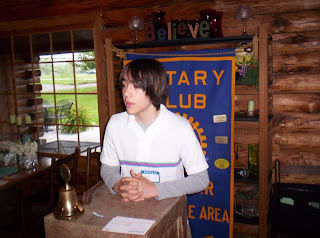 Baylen Earles, who is our Outbound Exchange student who is heading to Mexico. Baylen stopped by to tell us a little about himself and express his gratitude to Carterville Rotary for making this experience a reality. We wish Baylen good luck! 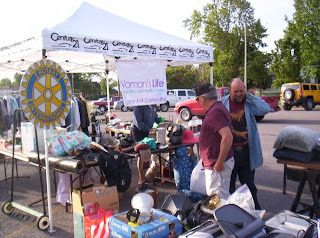 To help with the expenditures of his travel, Carterville Rotary will be partnering with Woman's Life and hosting a Yard Sale. When: Saturday, June 6, 2009, 8:00 a.m.- 2 p.m.
Where: First Baptist Church Parking Lot (on Division St). 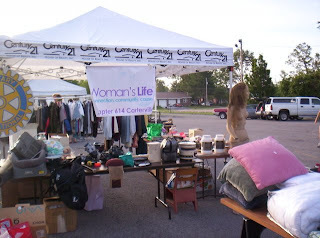 Bring in a box labeled "Rotary/Woman's Life Yard Sale" to the House of Busifingers, 1101 S. Division, at any time after May 13th. If no one is there, just leave it on the front porch. Most important- we need helpers to set up and help man the sale. Questions? Call Carl Cottingham, 618-521-0742 or 618-985-3354. 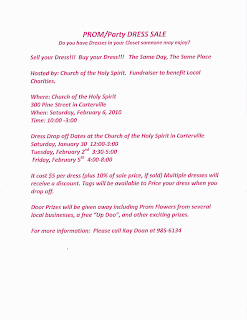 Also Visit The Carterville Rotary Club Website! The mission of Carterville Rotary is to bring together business and professional leaders to provide humanitarian service, encourage high ethical standards in all vocations, and help build goodwill and peace in the world and in the local community. One of the most widely printed and quoted statements of business in the world is the Rotary "4-Way Test." It was created by Rotarian Herbert J. Taylor in 1932 when he was asked to take charge of the Chicago-based Club Aluminum COmpany, which was facing bankruptcy. Taylor looked for a way to save the struggling company mired in depression-caused financial difficulties. He drew up a 24-word code of ethics for all employees to follow in their business and professional lives. The 4-Way Test became the guide for sales, production, advertising and all relations with dealers and customers. The survival of the company was credited to this simple philosophy. Since the test was adopted by Taylor's Rotary CLub in 1943, it has been translated into more than 100 languages and published in thousands of ways. the message should be known and followed by all Rotarians. Will it be the BENEFICIAL to all concerned?